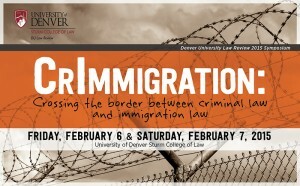 The Denver University Law Review is hosting “CrImmigration: Crossing the Border Between Criminal Law and Immigration Law” this Friday and Saturday. I’m thrilled that the journal’s editors decided to bring this topic to DU Law, where I teach, and to make it available online live through a livestream. As crimmigration.com readers are keenly aware, the boundary between criminal law and immigration law no longer has much meaning for literally hundreds of thousands of people every year. Interactions with the criminal justice system frequently lead to immigration detention and removal proceedings. Meanwhile, law enforcement officers and prosecutors are increasingly penalizing immigration activity. And let’s not forget that confinement—once an emblem of criminal proceedings—has now come to represent one of the most poignant features of civil immigration law enforcement. To jump into the nuances of this transformation, the organizers, led by my former student Lauren Parsons, have assembled a fabulous group of the nation’s leading scholars on crimmigration law. 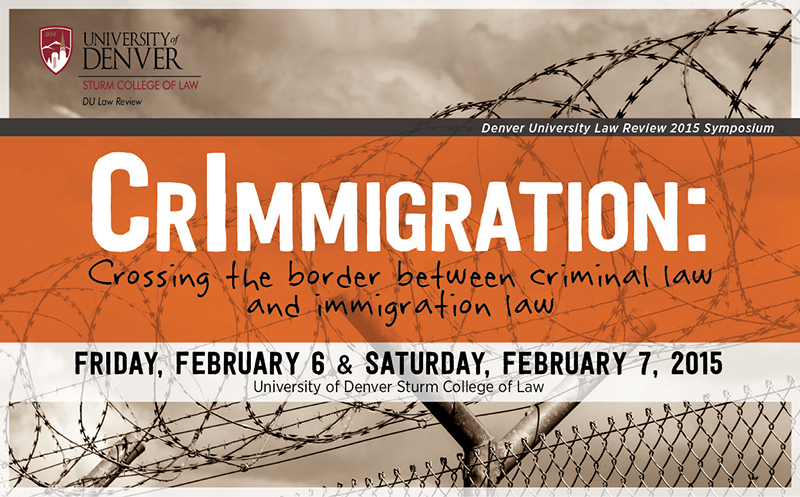 Headlining the two-day event are Jennifer Chacón (UC Irvine) whose work has transformed the legal scholarship on crimmigration law and Kevin Johnson (Dean of UC Davis) whose body of literature reaches into every aspect of immigration law. Rather than list the rest of the lineup, I invite you to take a look at the symposium schedule. And, of course, I hope you’ll follow the discussion by watching the livestream (available here) or the live Tweeting that I and others will be doing using the #DULRcrimmigration hashtag. Find this information useful? Then let others know about crImmigration.com, as well as César’s Twitter, Facebook, and LinkedIn pages. And to make sure you don’t miss an update, subscribe to the blog by entering your email address in the subscription box that appears on every page.